These are lyrics by Silver Convention that we think are kind of repetitive. Silver Convention's, "Fly Robin Fly"
The only words to the song, and they are repeated ad nauseam. 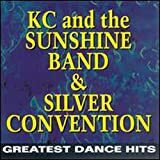 Silver Convention's, "Get Up & Boogie (That's Right)"
Their only other hit, and these are the only words to that song, which are repeated ad nauseam.